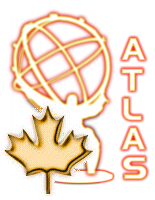 Why do Canadians work on ATLAS? Many particle physics experiments need to be done at very high energies. In order to accelerate particles (usually protons or electrons, sometimes heavy ions) to very high energies, we need large numbers of magnets with very high fields, and sophisticated radio-frequency cavities. In order to detect the products of collisions of these energetic particles, we need large and complicated detectors. ATLAS will probe energy scales at which theory and current experiments require that new particles must be produced. Our current understanding of particle physics is completely self-consistent at energies already explored, but unable to predict exactly what we will observe at higher energies. Only high energy experiments such as ATLAS will help us to see if there is a simple model which can predict everything that has been observed at lower energies. The LHC is a large and expensive machine. Canada could not afford to build a three billion dollar (CDN) accelerator on our own, and nor could any other country. The detectors are not only expensive, but complicated. There are not enough particle physicists and qualified engineers and technical personnel in any single country to design and build a complete detector. ATLAS is being built by groups from more than 150 universities and laboratories in 35 countries. Each group builds part of the detector, applying its own local expertise and resources, and contributes research funds to common construction and operating expenses. The CERN laboratory in Geneva (which hosts the LHC and ATLAS) was founded in 1954. One of the goals of the founders was to promote collaboration among scientists from countries which had recently emerged from the bitter conflict of the Second World War. Canadians working at CERN work alongside scientists from every corner of the globe, learning about other countries and teaching about Canada. By working on ATLAS, Canadians are able to participate in research that is on the cutting edge, internationally. For further reading on the physics discovery prospects of ATLAS and the LHC, see, for example, the article by John Ellis in the May 2007 CERN Courier.